Here you will find some of the finest barbeque enhancers in America. All of our fine sauces contain only All Natural ingredients. 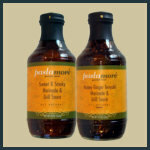 Many of our grilling sauces can be used as marinades as well. A soft rum aroma instantly whisks you away to the islands. Taste it for the sweet/sour tropical rich flavors along with a pleasant and not overpowering lingering spice. 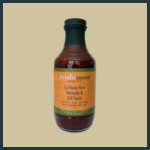 Best of all, care was taken to create a wonderful healthy gluten-free grilling sauce! Our Sweet Sriracha Sauce is life’s ambrosia! Smooth, rich ripe red tomatoes & brown sugar are brilliantly balanced with the heat of sriracha chili sauce. We add hickory smoke to complete the deal. Are there any better flavors than tangy, sweet & spicy? 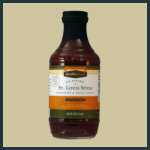 When you think St. Louis Style, you think thick, rich, red and tomato. This perfectly fits the bill – it oozes rich full ripe tomato. Our sauce is uniquely gluten-free and made with quality, healthy ingredients. No corn syrup here! Mild spiciness. 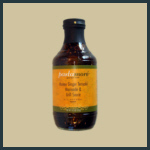 Our Honey Ginger Teriyaki Marinade & Grilling Sauce is a sweet yet spicy sauce perfect for adding a unique Asian flavor to any meal. 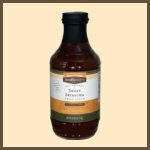 Our delicious Kentucky Bourbon Marinade & Grill Sauce is rich, pours thick and is full of deep Kentucky BBQ flavors. It is a crowd-pleaser and a lip-smacking sauce you will keep coming back for! The essence of umami, our version of the classic has a sweeter and more pronounce tang than the original. The balanced flavors explode in your mouth with a bigger punch. 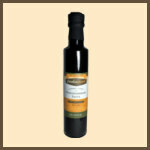 We barrel-age ours an additional 2 years, & we don't use anchovy, making it 'Vegan'!